On 5 April, Mission 25, Sortie 16, the target assigned to the group was the NOBALL installation at SIRACOURT (ST POL) FRANCE. This target had been hit before but the damage suffered was not enough to take it off the priority list. Twenty-five planes, led by Major LA ROCHE and Capt. FREEMAN, were dispatched to complete the work already started on this target. Due to a complete 10/10th undercast over the Continent and target, no bombs were dropped inasmuch as the target was located near a French village. No secondary was attacked due to the failure of GH equipment in lead plane. No E/A were seen and all A/C returned to the base with no battle damage suffered. After a two day rest we were once again alerted, this time to visit again our old friend the BRUNSWICK / WAGGUM A/F in GERMANY. On 8 April, Mission 26, Sortie 17, thirty-six planes with loads of 40 M1 cluster bombs, were dispatched under the leadership of Col. ISBELL, Major JAMISON, Major O’NEILL, with the following results: 1307-M1 clusters on the PT with excellent results, 40-M1’s on the target of opportunity with excellent results. Strong fighter opposition was encountered and our confirmed claims for this day were: 9-0-5. (See Appended S-2 Report for complete story of this mission) A/C 392, 753rd Sq. 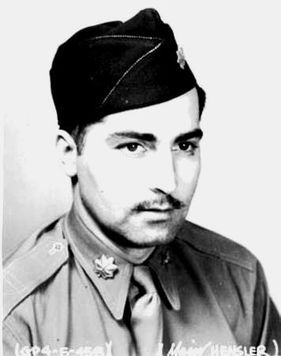 piloted by 1st Lt. E.A. Sievers, failed to return to base. (See Appended Missing Air Crew Report). Mission 27, Sortie 19, TUTOW A/F [pictured at right on this date], a new target to us, was to be our objective on 9 April 1944. The object, a [continuation] of the assault on the GAF, concentrating against major production of FW 190’s. The efforts of attacks today is against an estimated production exceeding 200 A/C per month. 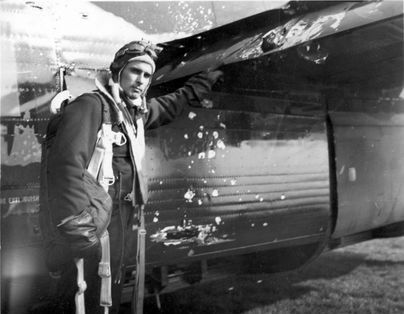 Nineteen aircraft were dispatched led by Major LA ROCHE and Major HENSLER, however, due to adverse weather encountered, only twelve A/C attacked with the following results: 140x500 GP bombs on Primary Target, and 10x500 GP’s on Secondary Target, PARCHION A/F. Hits were observed at north corner of NW field and bomb spotting photos show hangar completely obscured by smoke, but later photographs show no direct hits. (See S-2 Report for complete story) [Strangely omitted from this day’s narrative is the fact that four A/C and crews failed to return]. On 10 April, Mission 28, Sortie 19, we were again alerted to strike at the dwindling reserve strength of the Luftwaffe. Our object this day, the A/C factory at BOURGES, FRANCE, which produces an estimated monthly output of twenty-five SIEBEL 204 transport planes for the GAF. Twenty-one A/C under the leadership of Lt. Col. FIELING and Major JAMISON, attacked BOURGES with the following results: 84x1000 GP’s on Primary Target, and 30x1000 GP’s just short of Primary due to accidental salvo by Deputy Lead of one section. The results were excellent showing numerous bursts on workshops of SCNAC factory, direct hits on two hangars in NE dispersal area. This might [have] been considered an easy one for the boys, as no E/A were encountered, neither was any flak fired at our formation. All planes returned safely to base with no battle damage suffered. It seemed like we were being alerted every day and on 11 April we completed our 20th Sortie, Mission 29, with twenty-four A/C led by Brig. Gen. PECK, Col. ISBELL and Major O’NEILL, bombing the A/C factory at OSCHERSLEBEN, GERMANY with excellent results, dropping 144x1000 GP’s on the Primary Target. SAV’s show hits on S and E sides of airport. Crew report target area covered by smoke with some hits observed on south edge of field. Other hits on SE corner of factory area just south of main assembly shop and other hits on marshalling yards and adjoining buildings south of field. Other hits were observed in factory area and on marshalling yards to the south. On 12 April we were alerted and dispatched to attack another A/C factory just east of the town of OSCHERSLEBEN. At a point midway across the Channel, the Group Leader was notified by the Wing Leader that [the] mission was being abandoned. The Group returned to the base but was instructed to continue [the] mission by Flying Control which they did, however, approximately five minutes from the English coast the formation was recalled by the base. Mission 31, Sortie 21, was to see some of the finest pin-point bombing done by the Group. 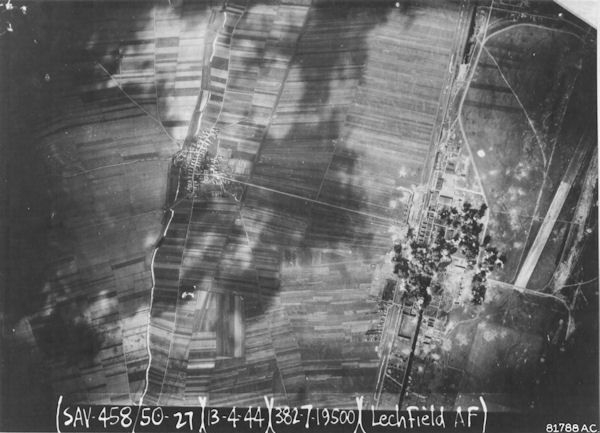 Our target for the day was LECHFELD A/F, 30 miles west of MUNICH, GERMANY, which is a bomber school, night fighting school, and [home to] factories, instructing German flyers from other types of planes [in] flying the ME 410’s. The results of our bombing is as follows: of a total of 200x500 GP bombs dropped on target, bursts of 169 bombs can be distinguished on strike photographs. Of this total, 159 are within 2,000 feet of the MPI. There are 80 bursts distinguishable within a 1,000 foot radius of the MPI, and 34 bursts within 500 feet of the MPI. Of the total bomb load dropped on the Primary Target, all but 10 bombs fell within a 2,000 foot radius of the MPI. 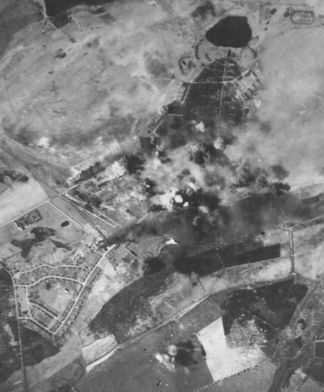 Numerous direct hits are visible on each of three large hangars, and a barracks area southwest of these hangars was enveloped by a heavy concentration of bombs. An elongated concentration fell across a ramp and refueling area east of the three hangars hit. In this area, at the SW corner of the A/F, three HE177’s, one JU-52, and one single engine A/C were, in all probability, destroyed by hits. The control tower may have sustained blast damage from a near-miss. A total of 65 A/C are visible on the A/F at the time of the attack. One A/C dropped 10x550 GP’s on an Autobahn and buildings at HEILBRONN, GERMANY. All in all, it was an excellent job and one to be proud of. Adverse weather conditions allowed us a rest, and it was not until 18 April, we were again called to continue our all-out assault against the enemy. Mission 34, Sortie 22, saw our formation of 26 A/C led by Lt. Col FEILING and Lt Col. HOGG take off with 21 A/C attacking with the following results: 21 A/C dropped 30x100 GP’s each on Secondary Targets. Three minutes from Primary Target the formation entered a Cirrus Stratus cloud bank which prevented them from bombing the Primary, however, a number of important targets were observed and hit with excellent results. One of our A/C failed to return [2Lt George W. Schuman] (See Missing A/C Report) Target for today was ARADO A/C WORKS at BRANDENBURG, GERMANY. Continuing our attack against the GAF and component A/C factories, our 23rd Sortie, Mission 35, [on 19 April] saw us attacking PADERBORN A/F, GERMANY. This A/F had not been previously attacked, and is a sub-depot for A/C equipment and A/C stores. Twenty-four A/C under the leadership of Brig. Gen. PECK and Col. ISBELL took off and bombed the Primary Target, showering it with 880x100 GP bombs, with fair results. All planes returned safely to base with but two showing minor battle damage. 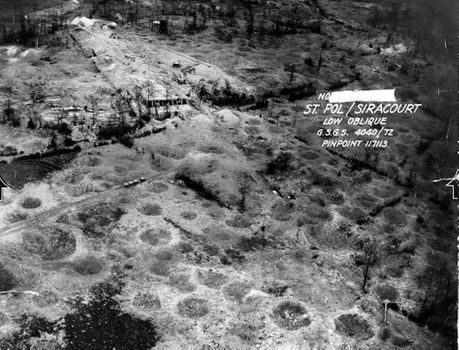 Our old friend ST POL, SIRACOURT, FRANCE [left] was to be our target on Mission 36, Sortie 24, 20 April. Of the fifteen A/C dispatched, none dropped their bombs due to weather obscuring the target, and rather risk dropping on friendly territory, all planes returned to base. 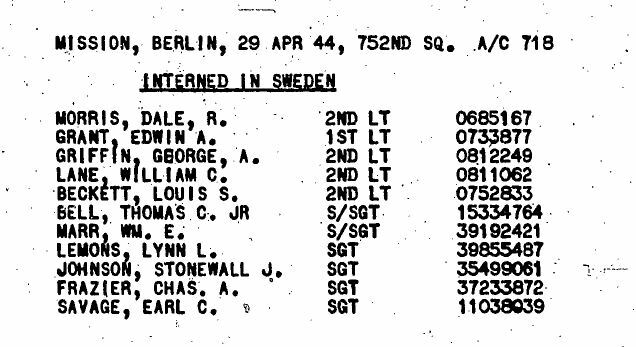 Mission 37, NO SORTIE, of 21 April, was directed against ZWICKAU A/C FACTORY in GERMANY. Thirty A/C took off but were recalled before reaching the enemy coast. 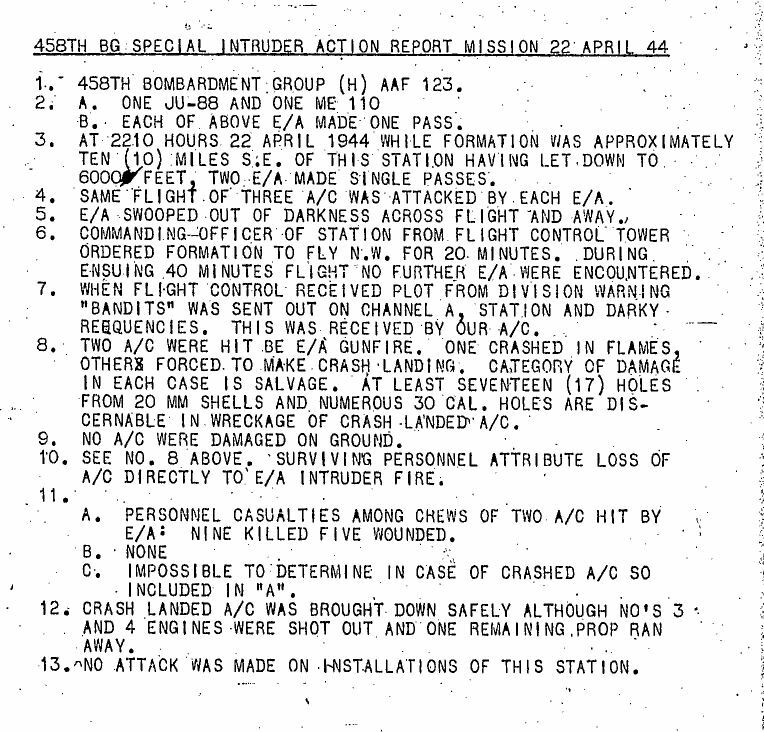 LEIPHEIM A/D, our objective for Mission 40, Sortie 26, 24 April, was successfully attacked with excellent results. Of the twenty-four dispatched A/C led by Major O’NEILL and Major LA ROCHE, all 24 A/C dropped a total of 240x500 LB GP’s on target. All A/C returned to base after this successful attack. Mission 42, Sortie 28, 26th April, was to see ourselves running into solid undercast over the Continent and at our target, PADERBORN A/F in GERMANY. Due to 10/10ths clouds, no bombs were dropped. No E/A encountered. Our first attempt at “two a day” fell on 27 April with Missions 43, 44 Sorties 29 and 30 respectively. Our A.M. mission was BONNIERES CONSTRUCTIONAL WORKS, FRANCE. Eighteen A/C were dispatch under the leadership of Major LA ROCHE, and Major HENSLER [pictured at right]. 170x500 GP’s were dropped on the target with fair results. No enemy fighters were sighted, all A/C returned to base with no battle [damage] suffered. Our P.M. mission, BLAINVILLE M/Y, FRANCE, saw 21 A/C led by Lt. WEBER and Lt. WOODWARD, drop 264x500 GP’s on Primary, with the first sections bombing as excellent and the second section as poor. A few E/A were seen at a considerable distance, but no attacks were made on our formation. All A/C returned to base showing no battle damage. Our last mission for the April activities was Mission 46, Sortie 31, 29 April to our old friend BERLIN. The heart of the German capitol was our target with emphasis placed on FRIEDRICHSTRASSE STATION, the main line, and underground stations in the heart of the city. Our bombs fell short of the target. Twenty-two A/C led by Col. FEILING and Major JAMISON encountered severe E/A opposition and our confirmed claims for the day were 9-1-3. A/C 718, 752nd Sq. pilot, 2Lt D.R. MORRIS, failed to return, but is reported interned in SWEDEN. 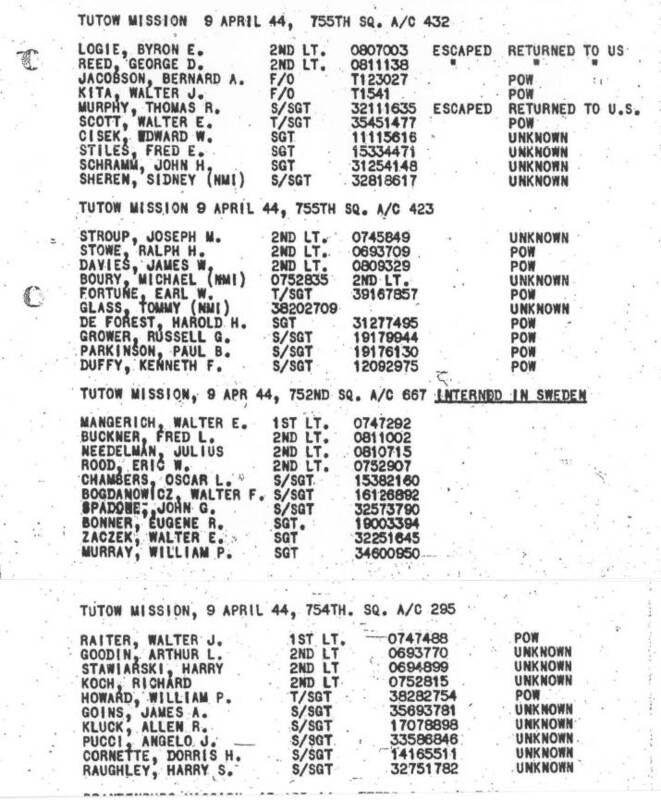 (See Missing Air Crew Report) 1142 M47 clusters dropped this day. 16 Sorties flown with total credit for Group of 374 [individual A/C] Sorties. Eleven crews failed to return to base. 533-1/2 tons of GP’s dropped on targets in enemy territory, plus 2449 M1 clusters. Confirmed claims for the Group: 23 Destroyed – 2 Probables – 9 Damaged.